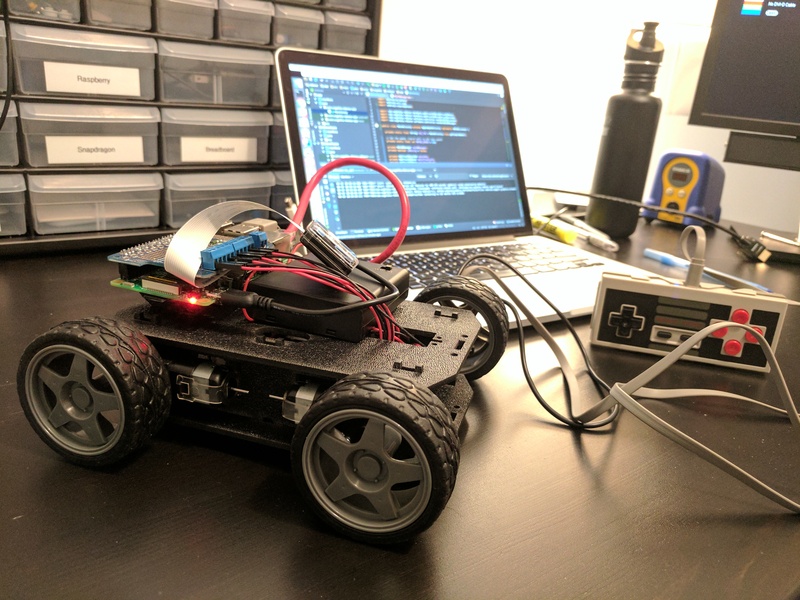 Build your own small autonomous car with Android Things. Welcome to the Android Robocar project! Visit our events page for slides from past events. I want to be able to drive my Robocar manually, with a regular controller, can I do that? Yes, we support for example the NES30 game controller, and most Bluetooth controllers will work too. How does it work? Does it use Computer Vision, or does it have some kind of AI? Both. The code shows how to use OpenCV to do lane detection with computer vision, and TensorFlow to implement a deep neural network that you can use to train the Robocar to drive itself. What’s the catch? What’re you really trying to sell me here? There’s no catch, all the software is open source built on top of off-the-shelf components that anyone can buy. We built this project because we wanted to learn how autonomous cars work, and make it easier for others to learn too. And because it’s real fun. Do you accept bug reports, code contributions, etc? I saw you present recently, where can I get the slides? Check our events page for upcoming dates and slides. I’d like to invite you to present about Android Robocars at our next conference/meetup/event, how can I reach you? You can send us a message on Twitter. I’m interested in sponsoring this project, how can I reach you? You can send us a message us on Twitter. Open a ticket or send us a message on Twitter. Questions? Please open a ticket.